Virtually every advice program to change our behavior starts with the same step: recognizing our habits. Sometimes that edict is worded as “admit you have a problem,” and sometimes we’re supposed to reach out to others for insights. Regardless, all advice along those lines comes down to one thing: We can’t fix what we don’t see, know, or understand. First we thought it might have been e.coli. Then we wondered if it was a food allergy. Then it just seemed like everything was annoying my system. That uncertainty made it impossible to fix. A little over a week ago, I finally got the official diagnosis (a c.diff infection triggered by all the antibiotics I had to take for my multiple surgeries last year *sigh*). That toxic bacterial infection is notoriously difficult to fight. It’s antibiotic resistant and has an extremely high recurrence rate that increases with exposure, so it’s likely something I’ll have to manage over my life rather than be able to cure for good. The same goes for our writing habits. Let’s take a look at some of the things we can do to identify our writing habits…so we can then work to improve them. What Bad Habits Might We Find? When it comes to writing habits, we might first think about the same kinds of habits we struggle with in other aspects of our life, such as procrastination or self-doubt. 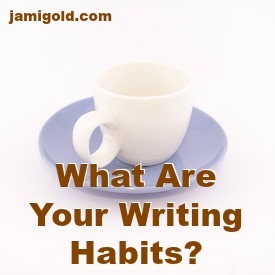 But there’s a different type of habit we might run into in the writing world—craft and storytelling issues. Some of us might struggle with passive writing or weak verbs. Others might tend to write without enough emotion or scene-setting. Or maybe we fail to create strong enough conflicts or Black Moments. Whatever our struggle, we might not even know we’re weak in those areas. Sometimes we might not be aware of that area of craft at all, such as when we’re climbing the learning curve and lacking the knowledge of all the things we don’t know. Other times we know that aspect of writing craft exists, but we don’t realize that it’s not a strength of ours. Either way, we first have to recognize our weaknesses before we can work on strengthening them. Just as with my latest infection, once we know the problem, we’ll better know what to research and where to focus our efforts. Choose one paragraph and figuratively tear each sentence apart, analyzing each word. Start with the last sentence and work backward, if necessary, to prevent a tendency to read the story and not the words. Does the subject of each sentence vary, or are there several all starting with he or she? Does each sentence focus only on one main idea, or do they tend to be too convoluted with multiple ideas? Are the sentences in active or passive voice? Are the verbs strong and vivid, or are they forms of “to be,” “feel,” or boring and workmanlike (walked, turned, etc.)? Do any sentences end on a power word? Does the paragraph end on a power word? Do any sentences suffer from filter words (knew, thought, felt, etc. ), weasel words (seemed, appeared, etc. ), point of view errors, flipped cause and effect, or other common issues that weaken our writing? Does reading the paragraph aloud reveal any other issues with flow, clarity, missing-word-style typos, etc.? Do any sentences include rhythm or voice or other style points we can build on? Once we get into this mode of micro-analyzing one paragraph, we can probably think of several more issues to check. We can then pick a few other paragraphs throughout our story to compare and analyze for other habits. But until we take the time to dig deeply into our writing, we might not think about what our instinct-level writing is like and learn where we should focus our improvement efforts. Does the scene have a beginning, middle, and end? Does it start with an interesting hook or situation? Does it establish the point of view and setting to anchor readers in the first few paragraphs? Does the protagonist have a short-term goal for the scene? Is the scene straightforward, or does the protagonist run into obstacles or setbacks, creating a “tension gap” between what they want and what they have or get? Does it end on a hook to pull readers to the next scene? Is there a sense of conflict, motivation, and stakes? Does the scene include emotion? Are any ideas repeated (or feel repetitive)? Does it weave elements together or rely on information dumps? Does the scene flow and have narrative drive? What does a color-coded analysis reveal about our mixing of elements? Does our scene have a larger purpose for the story? Should it be skipped, or is it a distracting tangent? Does it contain enough elements of a good scene? Sometimes, it’s only by pausing long enough to analyze a single scene that we’ll see why our story feels so choppy or lacking in emotion or suffering from slow pacing. So many elements go into good writing that it’s easy to have a bad habit to slack off on some of them, and we might not be aware of our tendency to slack off until we do this level of analysis. Complete a beat sheet—does our story have a solid story structure? Is every turning point as strong (emotional, tension-filled, etc.) as it can be? Write a synopsis and/or blurb—what does the story or emotional heart of those summaries reveal as the story we wanted to write? Did that actually make it onto the page? Create a scene list—does every scene contribute to the overall story? Do the stakes increase? Do the scenes flow with “but” and “therefore” transitions? What are our story’s themes? Can we make them stronger? Does the protagonist have an emotional/character arc? Can we make it stronger? Tie it into the themes? Add more emotion, tension, or personal stakes? Does our worldbuilding make sense and remain consistent? Does our story have a “so what?” factor that makes it worth reading? Have we brought that out in the text? Do our characters have reasons for their actions, or are they puppets to the plot? Do events have triggers, or do some exist for author convenience? When characters make questionable decisions, have we “sold” their motivation and avoided “why not just…?” plot holes? Does the story climax build on what came before, incorporating plot and character elements to feel both unexpected and inevitable? I could go on with many more issues we could check at each of these levels (just look at all my posts on this blog! ), but these questions above for this section cover most big storytelling issues. Our point here is to look for areas of our story where we struggle to bring elements together, where we fail to fully explore our ideas on the page, or where we might try to “handwave” away issues. If we tend to get the same type of feedback from multiple readers, or over multiple scenes or stories, chances are those comments are pointing out a weakness in our writing habits. If we’re hearing the same feedback repeatedly or from multiple sources, that’s a red flag for us to examine our habits. Each of these ideas is hard—like, fry-our-brain hard. We’re not going to be able to keep up this level of awareness and analysis all the time, or possibly even for more than a few hours. Do you know some of your bad writing habits? What are they? Have you ever worked through any of these approaches to discover your habits? What did you learn? Do you have additional techniques for figuring out what your writing weaknesses are? This is an excellent checklist for self-editing, Jami. Sharing! I hope you’re feeling better. You’ve had more than your share of medical issues. Time for them to let up on you! A great resource to help gain a bird’s eye perspective of your work and make sure it’s running on all four wheels. Thanks much Jami! Wow, your medical issues feel like my manuscripts: What are you on now—like draft number 62? Geez, let’s finish this up and get you healed! But this is a fabulous list. I have also found #4 to be a great source of weakness-spotting when you have a great critique partner. She makes me work hard, but then I don’t end up with those places where readers would be saying, “I’m not buying this.” (Yeah, character motivation’s been an issue for me.) Thanks for the great info! Glad you are finally getting some answers re: your health problems!! And thanks for the great advice on finding writing weaknesses. Praying for you. Believing you will be completely healed. I have no clue I had bad habits until I joined a critique group. And that posse can be brutal, which is a good thing. My mistakes run the entire gambit from sentence structure, scene boondoggles, to story structure. I can’t count the times the group has told me, “Donovan, I was totally lost.” And to me it was so clear! So my catalog of bad habits is long. Your checklist should help. All four points are things I need to look at more intensely. I might have to make up a worksheet for them.